A foundation text for understanding the relationship between early infant movement and adult psychotherapy. Since the mid-1970s, Ruella Frank has been exploring early infant developmental movements and their relationship to the later adult. She has brought her many years of experience as a professional dancer, yoga practitioner, bodyworker and long-time student of various movement theories to her work as a gestalt therapist, approaching relevant emotional and psychological concerns from an embodied and movement-oriented perspective. The result has been a unique integration of developmental movements within the therapy session. It has been my challenge to integrate infant developmental movement patterns and the most recent research in human development with gestalt therapy theory and practice. In my efforts to bring these dynamic strands together, a distinct approach to psychotherapy has emerged: one that makes lucidly evident the processes of early development as they continue to unfold in the present. In Body of Awareness, I explore the formation of infant movement experience and its influence upon the adult. Most significantly, I show how the organizing principles in early development are functionally equivalent to those of the adult. I demonstrate how movement plays a critical role in a developing self-awareness for the infant and throughout life. In addition, I have used a variety of case studies to illustrate how developmental movement patterns are part of the moment-to-moment processes within therapy. The client’s emerging patterns of breathing, gesture, posture, and gait are understood from a developmental approach. The case studies convey how, through a variety of experiments, our movement patterns can be subtly altered to enrich rather than inhibit our current functioning. Merging scientfic theory with a practical, clinical approach, Body of Awareness explores the formation of infant movement experience and its manifest influence upon the later adult. Most significantly, it shows how the organizing principles in early development are functionally equivalent to those of the adult. It demonstrates how movement plays a critical role in a developing self-awareness for the infant and in maintaining a healthy self throughout life. In addition, a variety of case studies illustrates how infant developmental movement patterns are part of the moment-to-moment proceses of the adult client and how to bring these patterns to awareness within therapy. Body of Awareness is intended to help therapists, new or advanced, to enhance their skills of attunement. They can do this by heightening their observations of subtle movement patterns as they emerge within the client/therapist relationship, and by respecting their own developing feelings within session as essential information to the therapy process. And as developmental patterns are central to psychological functioning, a background study of movement provides the therapist with critical insight into the unfolding psychodynamic field. 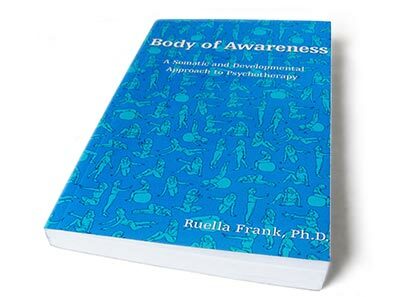 “In Body of Awareness, Ruella Frank has given us an exceptional integration of movement patterns within adult psychotherapy. Showing us how developmental dilemmas reflect in a client’s movement and embodiment, Frank brilliantly uses the gestalt therapy framework of body awareness, the emodied ground for contacting, practical experimentation and theory to make for real resources in psychotherapy. Gestalt therapists will find here a sophisticated, compatible and experientially oriented developmental approach which has been missing in our own theory. Body oriented psychotherapists will find presented a detailed and cohesive way of seeing and working that goes far beyond classical character approaches. If you would like to order the book, please click here.